Hair loss in children sounds weird! But in reality, some children have poor hair growth and experience hair loss at a tender age. There can be several reasons why children experience hair loss at a very young age. Some common causes include alopecia areata (loss of patches of hair), tinea capitis (ringworm of the scalp), telogen effluvium (thinning or shedding of hair), trichotillomania (a hair-pulling disorder), endocrine-related problems and nutritional deficiencies. At the same time, there are certain non-medical causes of hair loss in children, which include use of hair care products containing harsh chemicals, blow-drying their hair with high heat, vigorous brushing or brushing wet hair, and pulling the hair into tight ponytails or braids. While dealing with children’s hair loss can be an extremely devastating issue, you can take a breath of relief as there are several home remedies for hair growth and fighting hair loss in children. 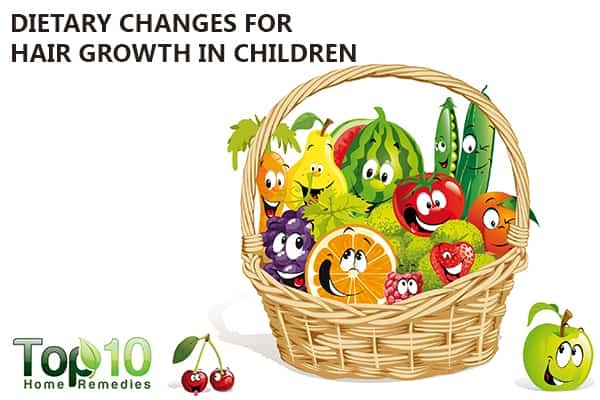 Here are the top 10 home remedies for hair loss in children. Even if your child’s hair looks silky or smooth, practicing a good hair care routine is a must or soon you may have to deal with different types of hair problems. To stimulate hair growth in kids, start with teaching them the importance of good hair care. 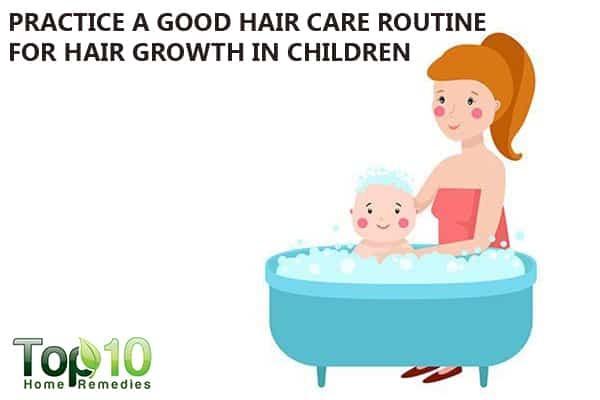 Wash your child’s hair gently but with a good shampoo, 2 or 3 times a week. Do not use hot water to wash your child’s hair. Use lukewarm or cool water. If you are having problems detangling your baby’s hair, try washing it less often and use less soap. Don’t comb, brush or tie up your child’s hair when it is wet. Leave it loose until it is fully dry. Avoid using blow-dryers and other heated hair instruments. Be gentle when brushing and don’t brush more than once a day. A hot oil massage is one of the best ways to treat hair loss in children. Massaging the head will improve the blood flow in the scalp, and subsequently enhance the development of new hair. Oiling also helps restore moisture in the scalp and hair, which is important for hair growth. A 2016 study published in Eplasty found that massaging the scalp for 4 minutes each day for 24 weeks resulted in thicker hair. 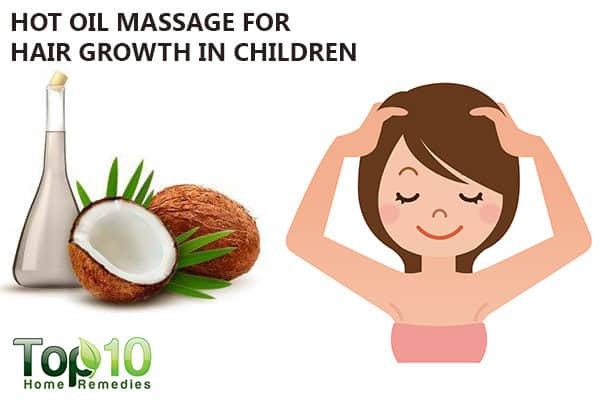 You can use coconut, almond, olive, jojoba or neem oil to massage your child’s scalp. When using neem oil, mix an equal amount of coconut or olive oil in it. Heat the oil of your choice, so it is warm but not too hot. Apply the oil on your child’s scalp and gently massage. Put on a shower cap, and leave it for 30 minutes or even overnight. Wash the oil out with a mild shampoo. 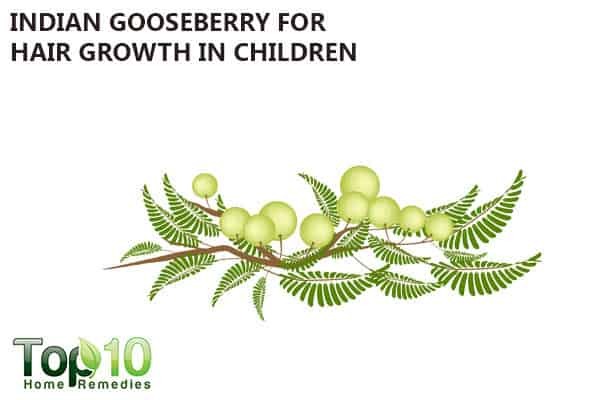 To promote hair growth in children, you can also try Indian gooseberry, also known as amla. The rich vitamin C content in Indian gooseberry helps with hair loss. In addition, the carotene and iron content helps improve hair health and promote hair growth. A 2017 study published in Evidence-Based Complementary and Alternative Medicine reports that amla might promote hair growth and enhance hair health. Mix equal amounts of lemon juice and amla pulp. Apply the paste on the scalp and massage thoroughly. Put a shower cap on and leave it overnight. Wash the hair with shampoo the next morning. Do this once a week to control hair loss. Alternatively, heat some coconut oil in a pan and cook dried amla pieces in it until they are charred. Strain and cool the oil. Massage your child’s hair and scalp with it. Leave it on for 30 minutes. Wash their hair with a mild shampoo. Do this on a weekly basis. 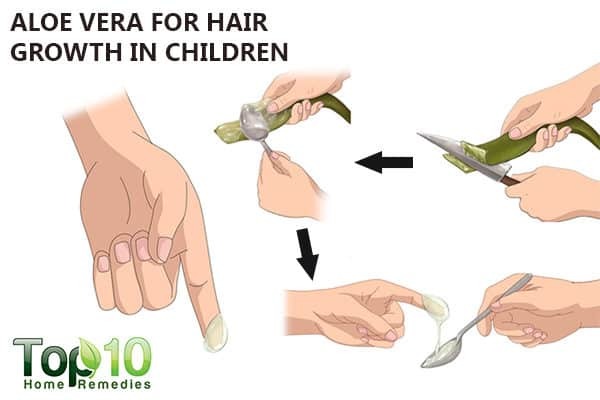 Also, give your child an amla fruit to eat every day to enjoy healthy hair. Another safe ingredient that you can use on your child’s hair is aloe vera. Aloe vera contains vitamins A, C and E, which aid in promoting healthy hair growth. Also, it balances the pH levels of the scalp and accelerates hair growth. A 2010 study published in the Journal of Chemical and Pharmaceutical Research reports that the enzyme content of aloe vera prevents hair loss . Apart from enhancing hair growth, it also does a great job preventing dandruff by moisturizing the scalp. Scoop out fresh gel from an aloe vera leaf and run it in a blender. Apply the gel directly on your child’s scalp. Leave it on for a few hours before washing their hair with lukewarm water. 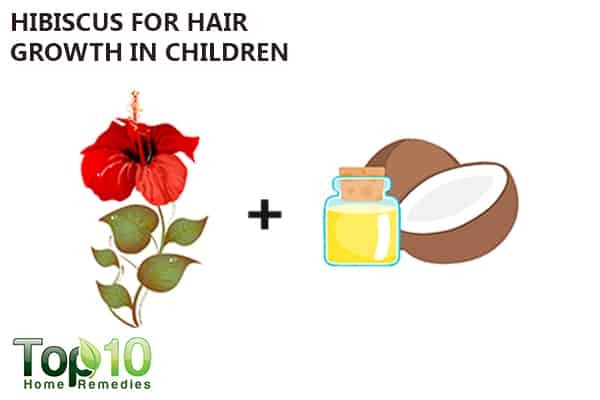 If you have a hibiscus plant in your garden, then there is no need to look for anything else to stimulate your child’s hair growth. The hibiscus leaves and flowers contain several natural properties that help treat hair loss and promote hair growth. Also, it has vitamins A and C as well as amino acids that are good for hair. A 2003 study published in the Journal of Ethnopharmacology found that the hibiscus leaf extract, when compared to the flower extract, exhibits more potency for hair growth. Add 7 or 8 Chinese hibiscus leaves and a few flowers to 2 cups of extra-virgin coconut oil. Heat the oil until the leaves and flowers are charred. Use this oil to massage your child’s scalp before going to bed. Wash your child’s hair in the morning. Coconut milk contains vitamins B, C and E, as well as iron and protein that help promote hair growth and prevent hair loss. It also makes hair soft and will add volume to your child’s hair. Apply freshly extracted coconut milk on your child’s scalp. Put a shower cap on and allow it to sit for 30 minutes. Rinse it out of child’s your hair with cool water. You can also shampoo their hair. 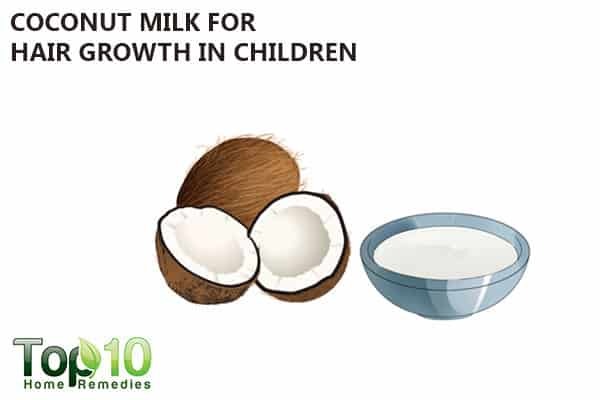 Also, include fresh coconut milk in your child’s diet. 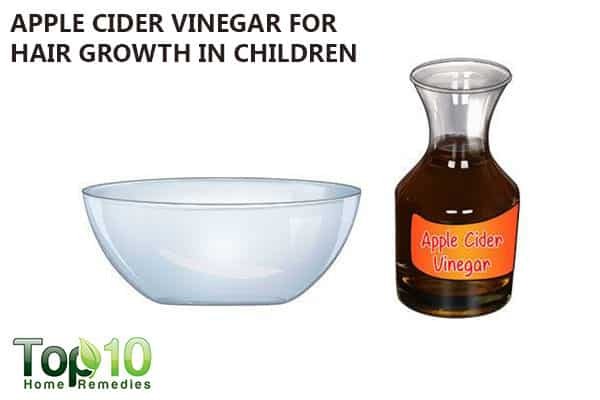 Apple cider vinegar is beneficial for hair growth in two ways. First, this slightly acidic liquid helps restore an alkaline state in the body, which in turn prevents any kind of infection of the scalp. Secondly, apple cider vinegar delivers key nutrients to the body that are important for hair growth. Apply this solution on your child’s scalp and massage for 5 minutes. Use this natural treatment a few times a month. 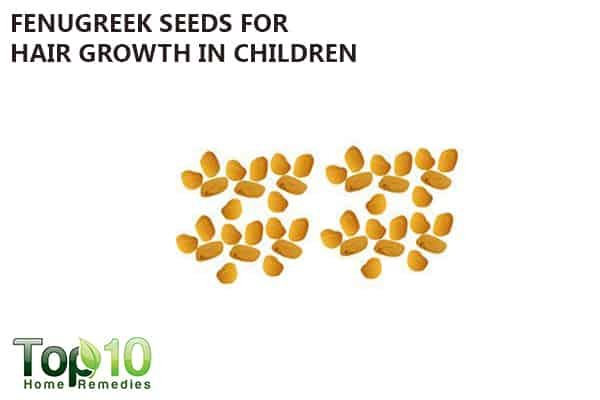 Fenugreek seeds are another excellent natural ingredient that can help keep your child’s hair problem-free. They are rich in protein as well as lecithin, which strengthens and moisturizes the hair. Fenugreek seeds also have antibacterial properties, which helps cure dandruff and any type of scalp infection. Soak a handful of fenugreek seeds in water overnight. The next morning, grind the soaked fenugreek seeds into a paste. Apply the paste on your child’s scalp and cover it with a shower cap. Leave it on for 40 minutes, then wash it out with water. Your child’s diet plays a key role in hair growth. In fact, a poor diet or nutritional deficiencies are linked to hair loss and poor hair growth. A 2017 study published in Dermatology Practical & Conceptual reports that multiple nutrient deficiencies may result in hair loss, which may include protein and several vitamins. Nutrient deficiencies may arise due to genetic disorders, medical conditions or dietary practices . Ensure that your child eats foods rich in vitamin A like dark green vegetables, strawberries, tomatoes and oranges to keep the scalp glands healthy. Give your child adequate vitamin C by including citrus fruits and drinks in their diet to help strengthen their hair. Provide more vitamin E by including green leafy vegetables, nuts and seeds in your child’s diet. Vitamin E improves the quality of the hair. For zinc and iron, include foods like pumpkin, molasses, whole-grain oatmeal and cereals, a variety of meats and leafy greens in their diet. As hair is mostly made of protein, make sure to feed your child protein-based foods. 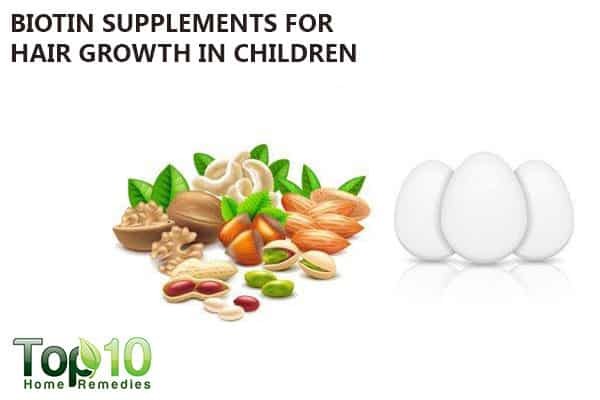 Biotin is one of the B-complex vitamins and can promote hair growth in children. First of all, biotin contributes to the creation of keratin, which is the protein your hair is made of. Secondly, it provides nutrients that are fundamental in the development of new hair. When taken as a daily supplement, biotin helps regrow lost hair and restore the nutrients needed in the body. However, before giving your child any supplements, make sure you consult your pediatrician. In addition, include biotin-rich foods in your child’s diet, such as eggs, yogurt, almonds, nuts, legumes, whole grains, milk and meat. You can also use shampoos and conditioners fortified with biotin. Do not compulsively twist, rub or pull your child’s hair. Stop your child if he or she has that habit. Teach your child to handle their hair gently when washing and brushing it. Use a wide-toothed comb for combing hair to help prevent pulling out hair. Avoid harsh treatments like hot rollers and curling irons. Protect your child’s hair from sunlight and other sources of ultraviolet light. If your child experiences hair loss due to some underlying medical cause or treatment, tell your child that he or she is beautiful and hair loss is nothing to be ashamed about.